Checking in to Little Bird was easy. I gave my name and showed my passport. Then, I was shown my room, a small thing with two bunk beds, a little wooden dresser and a chest-high locker unit. It was cute, with the mis-matched paint on the walls. And, the doors. The doors at Little Bird (and other places) actually equate to a little more than one normal door. Split in half. Which means, that big backpack on my back? Yeah. It’s a struggle the first time I walk through. Thankfully, I don’t plan on having my backpack on a lot of this little holiday. See, there are blessings of short-term travel. I walked in, heaving my backpack on the ground in the empty room, save the girl wrapped in her sheet on the top bunk across from me. The girl rolled over in the bed, looking at me, wavy burgundy hair tussled. “Sorry,” I whispered, crawling into my bottom bunk. “No, it’s OK,” she said. Ahhh. To be entirely vertical. And not on a hard bench. I buried my head in the pillow, relishing the semi-softness. Almost two days of traveling. It was my plan to sleep. It made sense to sleep. Then, Isabelle, the girl in the bunk, and I, struck up a conversation. Turns out, she’s from Germany. So we talked about that. Then, I found out she’s studying anthropology and is a food researcher and living with a family in a small town a few hours from Chiang Mai. She comes in every weekend. So, we talked about that. And all of the Thai food she got to eat. Then (whew) we get on the subject of Thai massages. Suddenly, sleep wasn’t nearly as important as a Thai massage. Within 30 minutes of my arrival, Isabelle and I were friends and the conversation we had rejuvenated my tired, tired body. I don’t even feel tired anymore. Jet lag? What’s that? She and I head out into the humid and overcast Chiang Mai morning. First, we get food. My first true Thai meal. 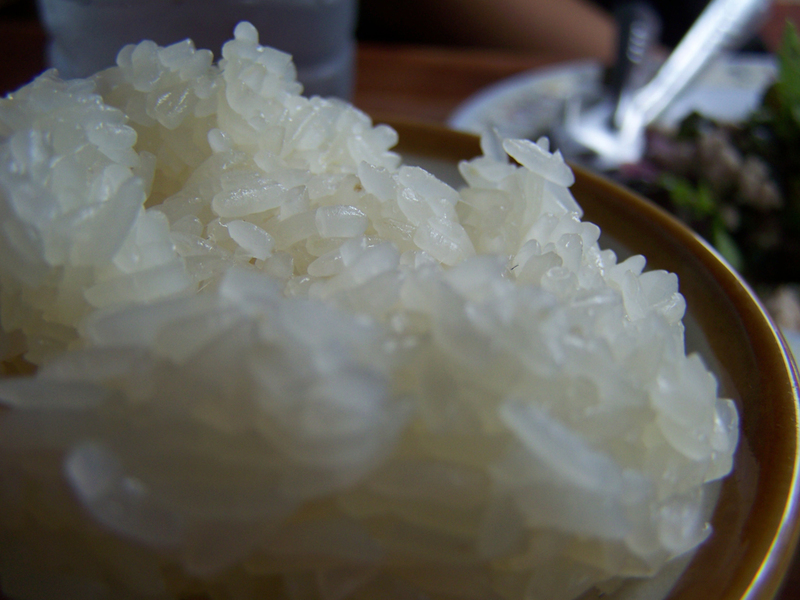 She explains to me the concept of sticky rice in Northern Thailand and its role as the dipper into food. 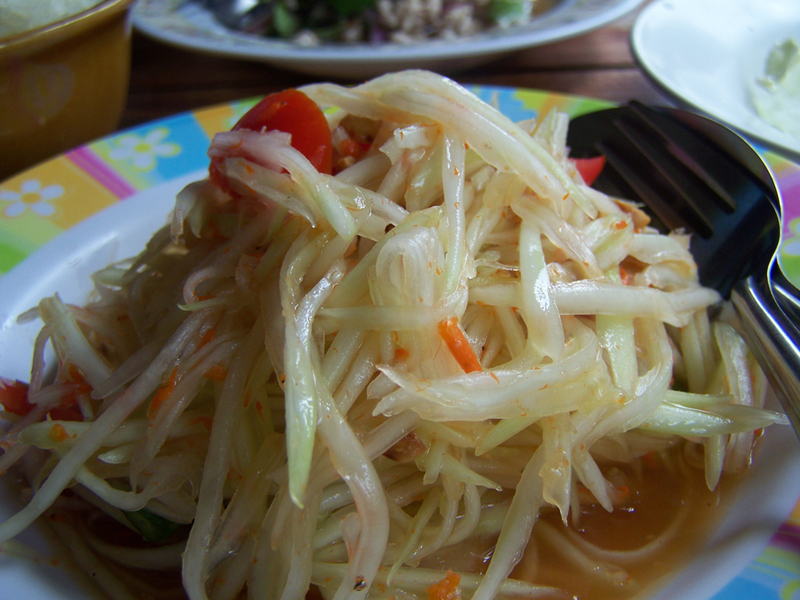 With our hands, we sit at a picnic table on a covered patio (which is the flavor of most Thai “restaurants”) and dip our sticky rice into my papaya salad and into her minced beef. On our walk to get food, we had passed a little sidewalk sign advertising Thai Freedom House. A place suggested to me on Facebook almost a year ago, I had seen updates intermittently. It had never occurred to me to go and find the place. So, we headed there after (what I am going to call lunch, even though it was more like a late breakfast). 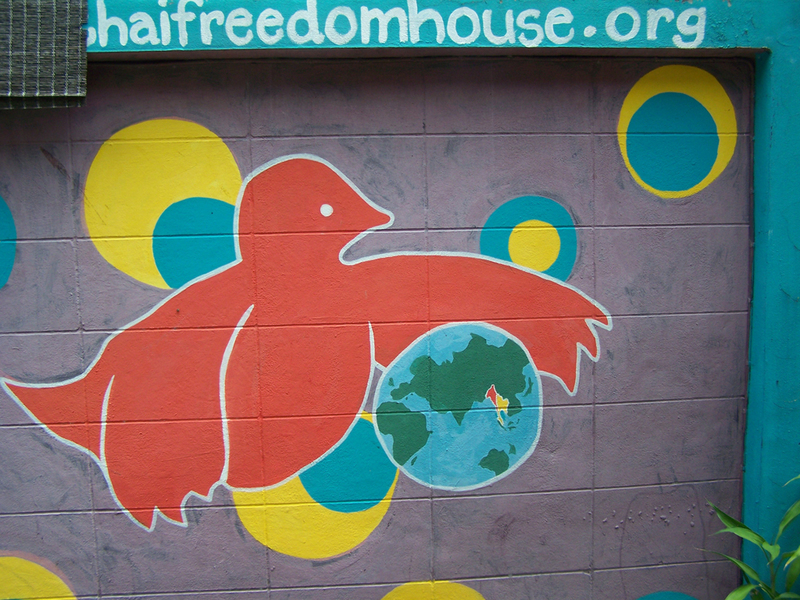 A whimsical structure with intricate window covers, quaint outdoor patio and colorful decor, Thai Freedom House has a clothing store below and a cafe upstairs loaded with musical instruments, books, games and information. It is actually a language and cultural arts center, and money goes to aid Burmese refugees and indigenous people from Thailand. 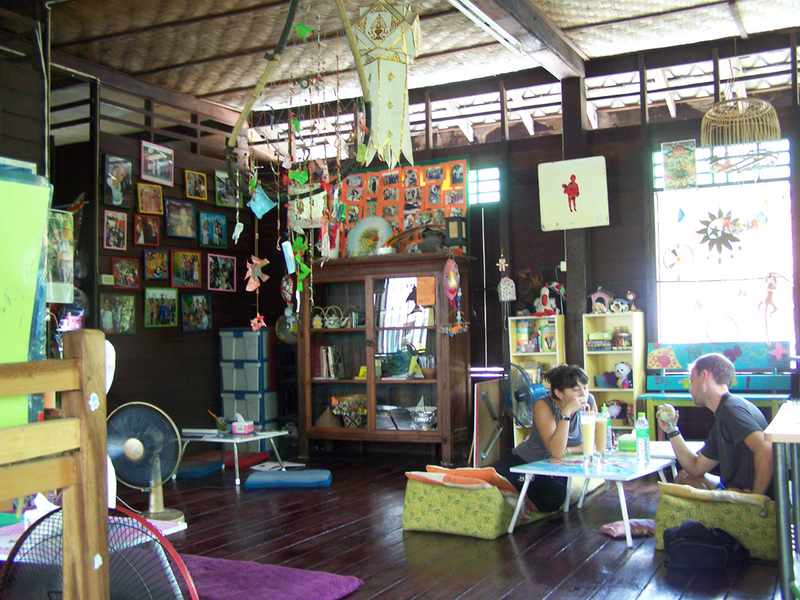 Isabelle and I sat in there for awhile, lounging on the cushions, taking in the cuteness the Thai Freedom House oozed. “You want to go get the massage?” She asked. A few minutes later, we were standing at the massage studio, curtains enclosed around our two thick mats. A pair of calf-length cotton pants lay folded on the mat. “What are we supposed to do?” I asked, looking from the pants to Isabelle. Throughout the entire massage. When they sat her up and she lifted her arms and put them behind her, letting her masseuse swing her torso from side to side, I mimiced her motions with my lady. Two days of travel magically erased as my body was stretched, walked on and kneaded. When we got up, I felt relaxed. We walked back to Little Bird, planning our night at a reggae bar down the street. “I’ve got to sleep for a little,” I explained, suddenly thinking of nothing but being curled up and passed out. When we returned, I hopped in the shower, then crawled into bed. She and I both napped for a bit, and then she woke-up. “Let me sleep a little longer,” I begged as she jumped down from the bed to go use the computer. I rolled over and sunk back into a deep sleep. I have no idea how many hours passed when I heard Isabelle move again. There’s no way I can go out tonight. I can’t stay awake. The exhaustion I hadn’t felt the entire day smacked me in the face. Hard. She didn’t come back with coffee. But, at some point well after the sun had set, she did come back into the room. I didn’t wake up. Until I heard our door open. I turned over, knowing at some point I was going to have to tell my new friend the likelihood of my going out was slim to none. A new girl walked into our room. Short brown hair. Huge smile on her face. Was I still asleep? Or, did my friend Katie, who was supposed to meet me in a week, just walk through the door? Hahahaha jetlag can do some craaaazy things to you!